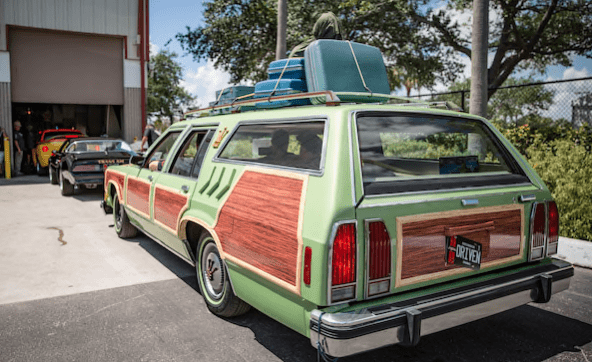 A replica of the ever popular ‘family truckster’ from National Lampoon’s Vacation sold for nearly $100,000 at a Barrett-Jackson auction in Palm Beach! As many of us know, National Lampoon’s Vacation is a road trip comedy from 1983 featuring Chevy Chase, Beverley D’Angelo, Randy Quaid, Dana Barron and Anthony Michael Hall. ‘Vacation’ was a box-office hit, earning more than $60 million in the US with an estimated budget of $15 million, and received positive reviews from critics. The buzz around this car as it rolled through the grounds at the Palm Beach auction was palpable as everyone whipped out their phones to take photos with the car, and when it hit the stage it was clear the bidders shared the sentiment as the price steadily climbed higher than anyone could have expected. When the auctioneer slammed his gavel down, the price had reached an almost unbelievable $91,000! The Wagon Queen Family Truckster was created specifically for the film. It was created by George Harris and is based on a 1979 Ford LTD Country Squire station wagon. You may remember the Truckster features a pale avocado metallic green paint job, imitation wood-paneling decals, eight headlights, a grille area largely covered by bodywork with only two small openings close to the bumper, a strangely placed fuel filler door, and a trash bag used for an airbag!